Natural Gas Versus Propane Furnace: Which One Is Better? People switch furnace types for many different reasons. Sometimes you might move to a new area where only certain types of fuels are readily available or affordable. For some of our customers, it is a growing concern about our fragile environment that triggers a switch to a new fuel type. In other cases, switch to a different furnace system can save on fuel cost. One big area of confusion for many people today is figuring out the major differences between natural gas and propane gas. When is one or the other a better choice? That is what we will look at in this post. Natural gas is a type of fossil fuel that is clean-burning. Natural gas is formed from the breakdown of decaying biological material. Natural gas is composed of methane, propane, ethane, butane and other flammable gases. Natural gas must be extracted from the ground, where it is trapped in rock and soil. Before this naturally occurring gas can be used, it must be processed into its consumer-grade form. In order to use natural gas as a fuel, it is necessary to run fuel lines to transport it. In more rural locations, this can make it cost-prohibitive for distributors to make natural gas available. Propane is one of several components derived when crude oil is refined (broken down). But propane is also one of the gases present in natural gas. Like natural gas, propane gas burns cleanly. It can actually help reduce the amount of greenhouse gases released into our atmosphere! As a liquid petroleum gas, or LPG, propane needs to be stored in pressurized tanks to remain in liquid form. When the pressure is released, the liquid becomes gas. Propane is very easy to store and transport, which makes it popular for powering a variety of small and large appliances. There are several factors to consider when debating which gas is better. The main source of debate is whether propane or natural gas is more environmentally friendly. The reason this is debated (and debatable) is that propane is one of the gases that makes up natural gas. Ultimately, propane wins this round because unlike natural gas, it is not a greenhouse gas itself. Both propane and natural gas are virtually odorless. Manufacturers include an odor additive as a safety measure to warn users if there is a leak. Propane is considered slightly safer to handle and is relatively easy to transport even in small quantities (such as for camping or RV use). If accidentally released, it will not harm the environment by adding any greenhouse gases to the atmosphere. But natural gas is safer to have on-site because the lines are buried deep underground. If a propane tank becomes dented or punctured or corroded due to rust, it can explode. Both natural gas and propane can improve your home safety in the event of an electric power outage, since you will still have access to power for vital needs. When compared unit for unit, propane contains twice as many BTUs (British thermal units) as natural gas—that is, it has twice as much stored energy per unit compared to natural gas. This means you can use half as much fuel to do the same job when you use propane. Figuring out whether propane or natural gas is the more cost-effective choice boils down to studying trends for your local energy prices. If both fuel types are readily available to you, figuring out which will save you more money will really depend on availability and competition in your local area. It is worth noting here that propane fuel appliances are often initially pricier to purchase than appliances using other fuel types. Here, a conversion makes sense only if the cost of propane fuel will save you money over the long run. Both propane and natural gas are clean-burning fuels, which means you are likely to have fewer issues with appliance clogs due to residue. However, poorly maintained or neglected appliances can cause incomplete combustion even when you are using a very clean-burning fuel. Both natural gas and propane can be used for a wide variety of appliance types, making the only major obstacle establishing household supply. If you are considering converting from one fuel type to another, this may require some up-front investment on your part. The reason is that natural gas and propane must be stored in different ways and at different pressure points. Natural gas is transported through gas lines. If you do not have existing gas lines servicing your property, these lines must be put in before you can use natural gas. For propane, you will need a storage tank. You can buy your own or rent a storage tank if you have the budget and space. Propane will last up to 40 years when stored at proper pressure. 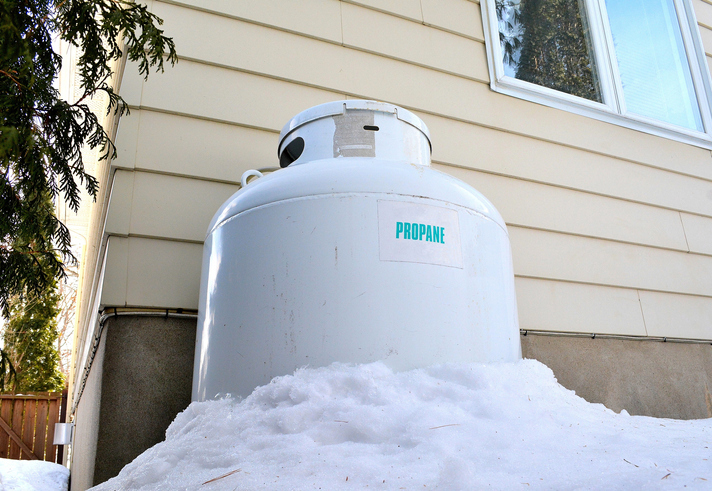 If you want to switch from propane to natural gas, you have the option to leave your propane storage tank in place or have it removed, along with its fuel lines. Because propane and natural gas are really quite similar, making the choice between these two fuel types is typically a matter of convenience as well as personal preference. We proudly carry a variety of makes and models of both propane and gas furnace appliances, and our prompt, polite and knowledgeable technicians are experts at installation! Do you need expert guidance to decide between a natural gas furnace and a propane furnace? We can help!